This week’s French Fridays with Dorie recipe was Cinnamon-Crunch Chicken. I seemed to fixate on the word “crunch”. It sent me down a weird and wonderful path of word association. Crunchy, crispy, golden, succulent, seasoned, roasted chicken. I couldn’t get this image out of mind. Speculoos became my scape goat. Or LU Cinnamon Sugar Spice Biscuits or LU Bastogne. How was I supposed to find them when I didn’t even know what they looked like?! My argument felt incredibly persuasive. I would find another chicken recipe from Dorie that would satisfy my cravings. Roast Chicken for Les Paresseux. I read the first line in Dorie’s introduction of the recipe, “les paresseux are lazy people, and this is a recipe for them”. I was on a winner! Some weeks I want to get lost in the complexity of a recipe. That’s what lead me to make Movida’s Chorizo Bomba and the Sweet and Salty Layer Cake from Baked. But the last few week’s I’ve spent the little free time I’ve had, sewing costumes for my 11 year old’s school concert. I need to make it clear here, I don’t usually sew and my contribution was small compared to what other’s were doing. But I found myself spending any free time I had doing this. 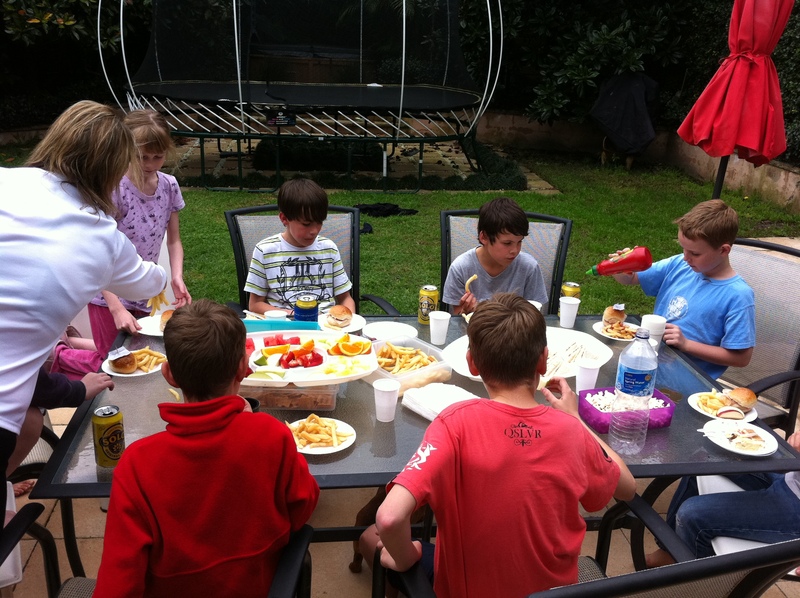 The kids had a great time while we sewed.. But it was really starting to wear me out! So all I wanted was to make something easy, familiar and comforting! And this recipe hit the spot. I then shoved a head of garlic cut in half, a sprig of rosemary, thyme and oregano inside the cavity. Placed the chicken on top of a couple slices of bread that I placed in the middle of the oiled roasting dish. Around the chicken I threw the other half of the garlic head, another sprig of rosemary, thyme and oregano and a few lugs of oil along with 2/3 cup of water. In the oven it went for 45 minutes at 450 degrees F.
Dorie suggests you add potatoes, carrots and shallots at the end of this time. I went with our favourite mix of potatoes, pumpkin, red capsicums and spanish onions. Another 45 minutes and it was done! And oh my goodness, it was so tasty! It was exactly what I had envisaged and what I was craving! It was also incredibly easy to make and I even got to start reading my latest neuropsych book with the free time I had! The French Fridays with Dorie group made Roast Chicken for Les Paresseux before I joined the group, so I was glad to catch up on a recipe I had missed! A recipe I will definitely make again and again! And I can’t wait to check out what the group thought of the Cinnamon-Crunch Chicken! Tags: baking, chicken, cooking, food, french food, french fridays with dorie, recipes, Roast | Permalink. Your chicken looks amazingly delicious! Love the coloring. 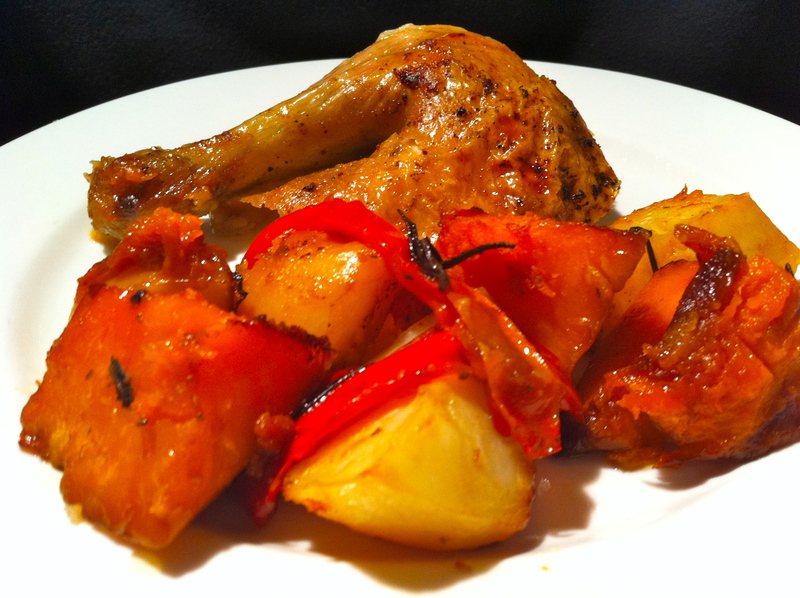 Wow, your roast chicken certainly looks more succulent than our cinnamon non-crunchy chicken! Great of you to help out with the children’s costumes. That chicken looks fantastic, Sanya! What a great substitution. I had the same problems as you and instead of baking the Cinnamon-Crunch Chicken, I baked the speculoos which had already been featured in FFwD before I joined. Yay, I’m not the only one who didn’t do this week’s recipe. Everyone else seems to have found a work around and I’m just lazily waiting for the cookies. Oh well. And I LOVED this chicken recipe. 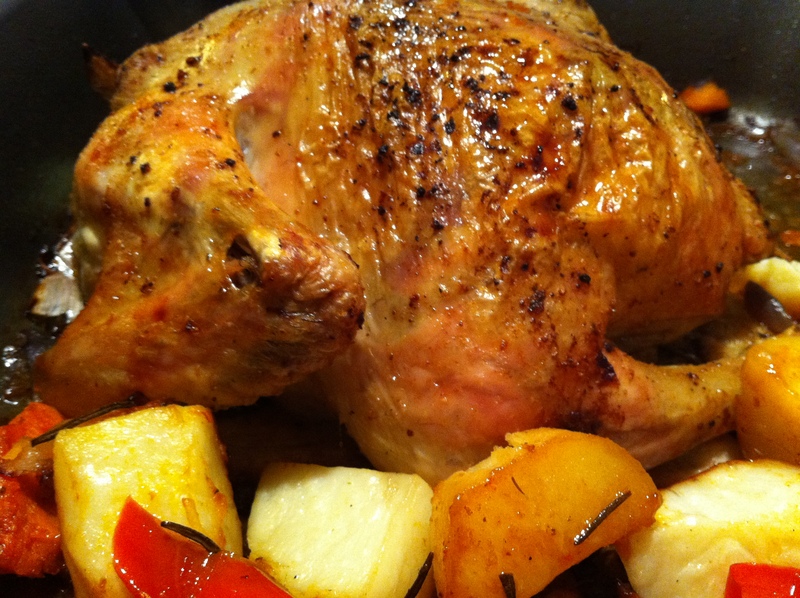 It was definitely one of my favorites and is not my standard roast chicken recipe. So tasty and so easy! Sanya, this is one of my favorite recipes we have cooked and one I was most proud of because it was not only delicious, but also beautiful. Yours looks perfectly golden. I am sorry you couldn’t find the cookies (it took me awhile to find them here), and didn’t get to make this week’s recipe, but gosh this was a great substitute! Your post makes me want to make it again. Seems like many of the American cooks among us had a hard time finding the cookies, so I can’t imagine the challenge on the other side of the world… Truth be told, I didn’t love the cinnamon-crunch chicken, but I remember how much I loved the chicken for lazy people. You definitely picked the better recipe. Oh my, I have never cooked such a good chicken! I even did a couple things wrong and it was still amazing. I forgot the 2/3 cup water in the pan and I accidentally cooked it with the back up and the breast down. I am a really lazy cook, so I just seasoned it with salt and pepper (liberally). Then I rubbed some garlic butter I had mixed up all over the bird. I put the garlic inside and around it, like you said. And it was beautiful. The ends of the legs and wing tips weren’t burnt or dried out, and the whole thing was beautiful golden brown. For nine years, since we started doing a family dinner every Friday night, I’ve been buying rotiserie chicken from the hot deli at the grocery store. I’m going to start cooking chickens! I think people everywhere love roasted chicken and yours looks moist and delicious. Good choice. This “lazy” chicken recipe was a favorite at our house…when it cools down…maybe in a couple of months…I’ll be roasting another of these chickens. Everyone loves it and so easy. The recipe this week turned out better than expected, however, the one you chose is excellent. It sounds like you made the right choice on this recipe – I can’t imagine how disappointed you would have been with the non-crunchy (albeit delicious, I think) cinnamon-crunch chicken! Your chicken looks perfect. I loved this chicken too – it’s a great recipe ‘for lazy people’ (which mostly means people who have too much going on to spend hours in the kitchen, even though they love spending hours in the kitchen…). The lazy chicken was good! I had forgotten about it but need to go back and make it again. I ended up using Teddy Grahams in my recipe since I couldn’t find any of the suggested cookie options and didn’t want to run all over town. This is one of my favourite French Fridays recipes (though it’s hard to choose). I love seeing people’s catch up posts – it reminds me of all the lovely things that have been made so far. Your chicken looks fabulous and I really like the vegetables you added.